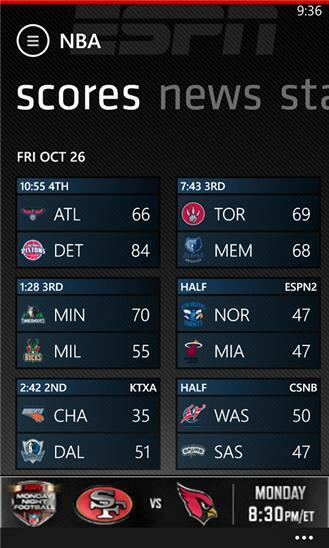 ESPN ScoreCenter brings you scores, news, and standings from hundreds of sports leagues around the world. Never miss another goal, pitch, basket, try, touchdown or wicket. Whether you follow the NFL or the Premier League, the Ashes or MLB, MMA or Formula One, ScoreCenter offers the most comprehensive global sports coverage available on your Windows Phone. 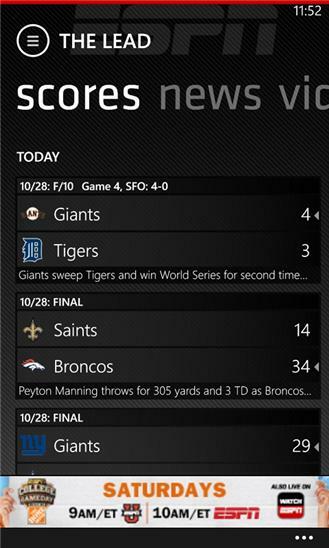 ScoreCenter Features:* Personalized scoreboards and live look-ins into gamecast for play-by-play, in-game stats, boxscores, and game summaries* myTeams: Follow your favorite teams in one place. Pop in to get scoring updates or catch up on news coverage of your favorite teams from ESPN and from local sources* The Lead: Stay on top of the most important live events of the day, read up on breaking news and analysis, and watch just-cut video clips* Deep news and analysis across dozens of leagues, powered by ESPN’s ‘round-the-clock editorial staff* Live Tile: Pin a team to your to your start screen for live game coverage*Scoring Alerts: Full season and single game scoring alerts. Get game start, scoring plays, end of period/qtr/half, and final score alerts* Follow teams from hundreds of leagues including:- NFL Football- NBA Basketball- NCAA Football, Basketball, Ice Hockey, Baseball, Lacrosse, Water polo, and more- Premier League, UEFA Champions League, and hundreds of additional soccer leagues and tournaments- NHL Ice Hockey- MLB Baseball- NASCAR, Formula 1, Indycar- Golf- Tennis- MMA- Cricket- Rugby...with more added all the time...Follow us @scorecenter on Twitter for updates or to ask questions and provide feedback.